Cardiff Devils man of the match Mike Hedden. Pic: Richard Murray. 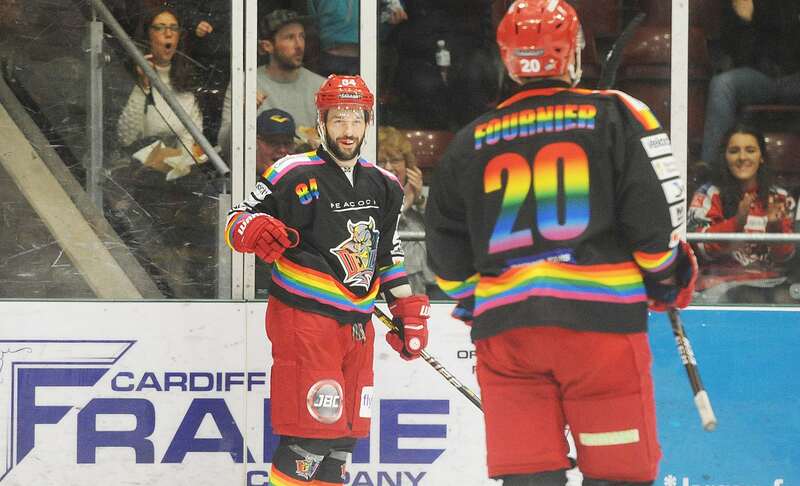 Cardiff Devils took Andrew Lord back to the late 1980s during their thrilling, but odd, Elite League ice hockey win against Coventry Blaze at the Viola Arena last night. Captain Jake Morissette scored a late shorthanded winner to hand Devils a 6-5 victory and head coach Lord said: “What a night! “It reminded me of watching the Oilers back in the 80s when they played an open, off-the-rush style. “We certainly weren’t playing our normal game against Blaze. “Coventry played a 1/4 trap and kept us to the outside. We had plenty of 0-zone time, but they made it difficult. Their goalie (Matt Hackett) made some timely saves as well. “It was a huge win at this time of the season. I loved the character we had to claw it out and our captain (Morissette) scored a big goal. “At times we need to make better decisions and we weren’t great with puck. Calgary-born Ben Lake, the League’s leading points scorer on 60, was a key player for Blaze and Lord said: “We talked about Lake until we were blue in the face and it didn’t make a difference. It was a night when Devils were far from their best, gave away the puck too often, lacked big match intensity and struggled against Blaze counter-attacks. Morissette popped up with the winner when Blaze were looking for a winner on the powerplay. Mo’s first shot was saved, but he tucked away the rebound and Devils secured their second successive win to stay top of the table. Coventry coach Danny Stewart said: “We had a powerplay and four of our guys were caught low. Devils took a shot, got their own rebound and sealed the game.